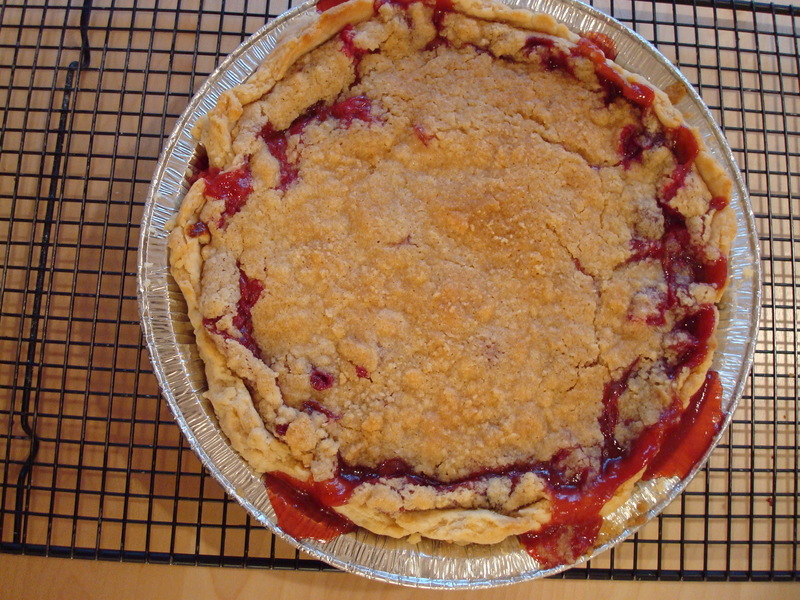 I had a request for the recipe for the Cranberry Brie Pie I made for Thanksgiving so am posting it now. Unfortunately I could not find the origin of the recipe online as I clipped it from a magazine years ago, which is a shame because a) I’d like to give proper credit where credit is due, and b) people need to know about this recipe and then go out and make it! Updated 12.15.11: recipe came from Fresh Home magazine. Like any cranberry recipe (at least any cranberry recipe I’ve tried) you have to first cook the cranberries down to soften them up a bit. Then you pair them with a little bit of creamy, slightly salty Brie cheese in the shell of a pie and top with a butter/brown sugar/flour combination for a nice crispy finish. The combination of flavors was awesome– the tart from the cranberries with the savory, salty bite of the Brie, and the sweet of the brown sugar topping. Awesome. It was my favorite dessert at Thanksgiving this year but could certainly make a great finish to any meal this holiday season since cranberries are still abundant in grocery stores. Take advantage! Last night I had a small Christmas party and spent oh, about 7 hours preparing for it yesterday so am a little bit beat this afternoon. This week I will be posting some images from the party with tips on how to survive your own holiday shindigs this time of year. I definitely learned a few lessons myself and am happy to share them so that you do not make the same mistakes I did.. 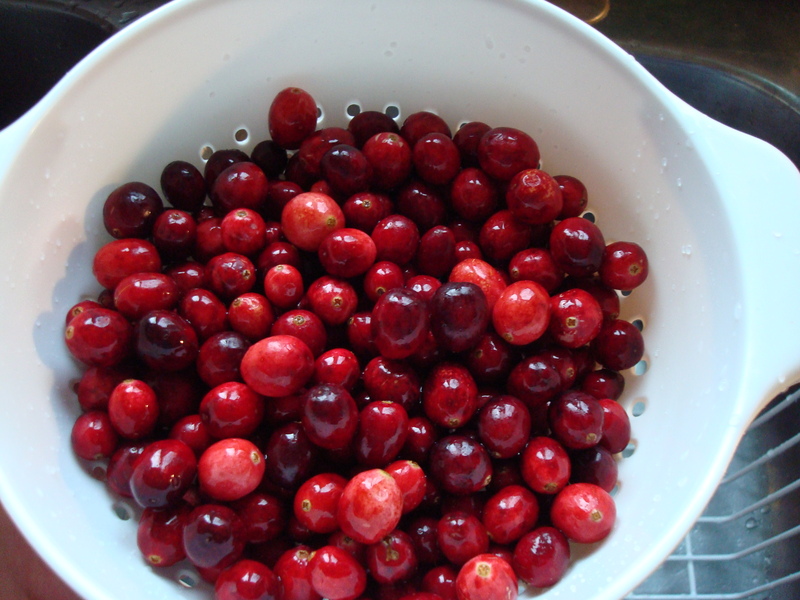 In a small saucepan, combine the cranberries, brown sugar, orange juice, flour and vinegar. Cook over medium heat until berries pop, about 15 minutes. Meanwhile, unroll pastry into a 9-in. pie plate; flute edges. Sprinkle with cheese and bake at 450 degrees for 8 minutes. 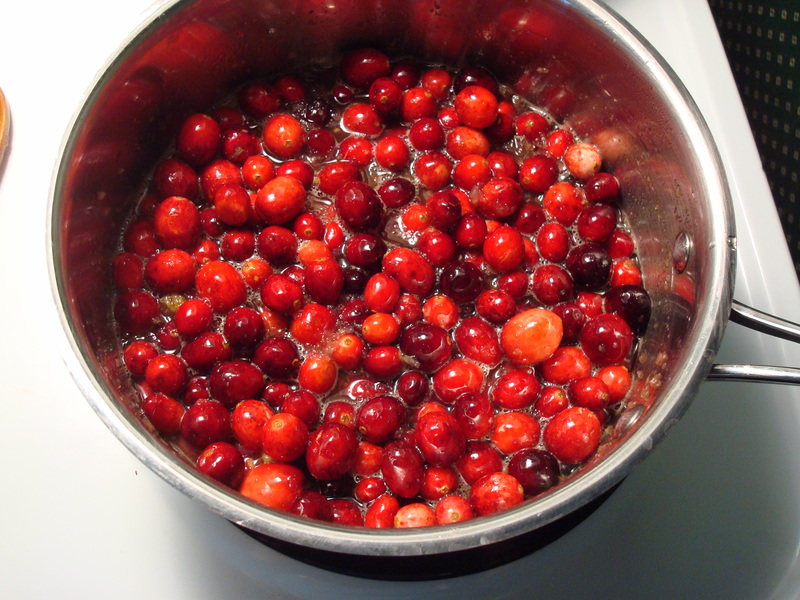 Remove cranberry mixture from the heat; stir in vanilla. Pour into crust. Dot with butter. For topping, in a small bowl, combine flour and brown sugar; cut in butter until crumbly. Sprinkle over filling. Bake at 350 degrees for 30-35 minutes or until the crust is golden brown and filling is bubbly (cover edges with foil during the last 20 minutes to prevent overbrowning if necessary). Serve warm or at room temperature. Refrigerate leftovers. Mix flour and salt in medium bowl. Cut in shortening, using pastry blender or crisscrossing 2 knives, until particles are size of small peas. Sprinkle with cold water, 1 tablespoon at a time, tossing with fork until all flour is moistened and pastry almost leaves side of bowl (1 to 2 teaspoons more water can be added if necessary). Gather pastry into a ball. Shape into flattened round. If desired, wrap flattened round of pastry in plastic wrap and refrigerate about 30 minutes to firm up the shortening slightly, which helps make the baked pastry more flaky and lets the water absorb evenly throughout the dough. Roll pastry on lightly floured surface, using floured rolling pin, into circle 2 inches larger than upside-down pie plate. Fold pastry into fourths and place in pie plate; or roll pastry loosely around rolling pin and transfer to pie plate. Unfold or unroll pastry and ease into plate, pressing firmly against bottom and side and being careful not to stretch pastry, which will cause it to shrink when baked. Hey Kirsten! I’m flattered beyond belief! Last year I freelanced for Fresh Home magazine and did a story called Wide Eyed Pies in which I created the four pies. I’m making a variation of the Blueberry Mascarpone Chess Pie for a Christmas party and was googling it to show a friend when I found your blog. Fresh Home has since folded and I guess the pies were removed from the net… I’m so glad you put the Blueberry Chess pie and this one online! The other two pies in the magazine were a Lamb and Pear Curry Pot Pie and a Sweet Potato Pie with Blue Cheese and Bacon Lattice. Developing these pies was one of the most fun things I’ve ever done and thank you so much for keeping it alive online! Holy smokes! I’m flattered that you found my website and commented! Funny thing is I also clipped the recipe for the Sweet Potato Pie with Blue Cheese and Bacon Lattice so will no doubt be making and posting it here one of these days. I’ll go back and fix the Cranberry Brie and Blueberry Mascarpone pie posts to give proper credit where credit is clearly due. Thanks! Cheese and pie … a match made in heaven. My wife tried homemade cranberry sauce over the holiday and it was amazing. This recipe may be nirvana. Thanks for posting!